For Leads: Connect your website-forms (or connect your CRM) to send immediate auto-responders and sequential emails (e.g. Day 3, Day 7, Day 30) that nurture their interest. Perform triggers (e.g. scoring, alerts, further automated/branched email patterns) based on what they do, and don't do within each email. For Employees: As new hires come on board, send out automated emails that introduce them to company benefits, culture and events. For Events: Create "count-down" email patterns that drive traffic and participation in shows, events, webinars and more (e.g. 30-days-prior, 1-day-prior, 1-day-after). For Abandoned Shopping Carts: Connect your e-commerce system (e.g. Shopify, Magento) to send automated emails that provide one-click access to their previously abandoned cart. The buying cycles have changed in today's fast-paced and information-rich Internet world. Research shows that when a prospect becomes engaged and is researching solutions, businesses often have just a few hours to capture and respond to that lead - or the sales-window will close. Automated lead-nurturing - if done correctly - can provide unparalleled returns. Extremely simple to learn and use, TailoredMail allows you to create automated campaigns with just a few clicks. They can be as straight-forward as an automated “welcome message” when people opt-in on your website (or an abandoned shopping-cart message), with a follow-up email 7 days later offering further introduction to your company/products. Or, they could be designed as multi-email “drip campaigns” sent over several weeks or months after the prospect downloads a brochure or white paper. These campaigns can include scoring, triggers, alerts-to-sales, and dynamic content to match the buyer’s specific interests (e.g. send technical content to CTO's, and marketing content to CMO's). To toot our own horn, TailoredMail's automation capabilities won a recent Stevie Award and ClickZ Marketing Award by helping Chevrolet of America sell more than 2,000 new cars in a three-month automated campaign. Targeted content was ‘dripped’ to prospects based on their email and website behavior during the 60-days prior to the campaign. 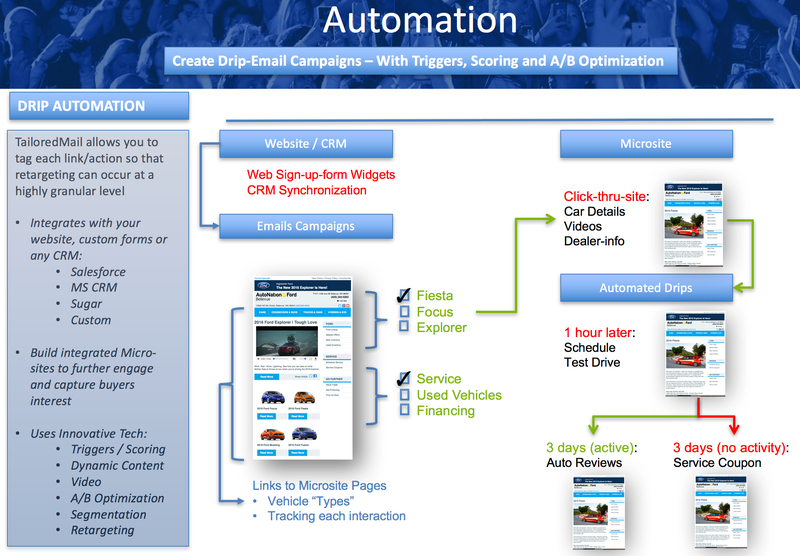 The use of automation is reshaping marketing, as we know it. The Internet and power of search engines have dramatically changed the sales cycle, and adapting to it through automation is critical. Most buyers now conduct product and competitive research from their own desktop, and do not want to engage a salesperson until they are in the very late stages of the buying cycle. Automation can capture the prospect during the research-phase, and mimic the sales process by dripping out emails that “tell a story”, building upon each other. Set it up once, and ‘let it run automatically’. The other important factor in the buying cycle is ‘response time’. Studies have shown that a prospect who has visited your site and requested more information will only remain interested in your company for a couple hours before they will dismiss you outright and move on to other offerings. Automation allows you to handle leads immediately and with professionalism – let alone invaluable tracking of interest(s), timing and needs. Through the use of scoring and on-going (real-time) analysis of the results, marketers can continue to optimize the email content, timing, sequence, and engagement levels to know WHEN to turn the lead over to sales. As a result, sales benefits by having more qualified leads and vast amounts of details on the prospects email, website and social behaviors. Tie it all automatically into your CRM and you have a powerful strategic weapon. Add our simple 'lead-tracking-snippet' to your website, and immediately identify and convert leads. See how your email campaigns perform AFTER the click - where do they go on your site, what goals/pages do they reach, and what campaigns (email, ads, SEO) perform best? Alert yourself or sales when top clients visit the site. Score them to sift through the luke-warm to highly-engaged prospect. Trigger follow-up email campaigns based on prospects visiting specific pages, or filling out forms using our built-in form widget-maker (with Social Sign-up via LinkedIn and Facebook). TailoredMail makes setting up a nurturing/follow-up campaign dead simple. Our authors comment all the time, 'I've tried others (Marketo, Exact Target, Eloqua) and those products are insanely complicated. Yours is the first one to make it dead-simple." You can create a nurturing campaign in less than 5 minutes. Create scoring, triggers, landing-pages, auto-responders - and test it all with absolute ease. Design clever sending patterns to avoid weekends, or deliver messages every other week - the combinations/options are unlimited. Easy Targeting to Different "Personas"
Plus, we take that ONE STEP FURTHER by giving your sales team their very own email-responder tool that empowers them to choose from a library of content you design, and receive alerts when recipients open or click on links in the message. A fully closed-loop solution.